FCA requires collision repairers to perform destructive test welds prior to attempting any welding on a customer’s car, Collision Advice CEO Mike Anderson pointed out in a Friday webinar. Anderson said every OEM he works with requires the test welds. “This scares me a ton,” he said, apparently questioning whether shops were doing them. He cited language from the 2017 Chrysler Pacifica body repair manual demonstrating the test weld mandate. This extends to squeeze-type resistance spot spot welds, according to another passage cited by Anderson. “We need to make sure that we’re doing that,” Anderson said. “Keep in mind that different material coatings, coating thickness, material thickness, and joint configurations have a direct impact on nugget size,” FCA writes. As with any equipment, proper training is required, and in the case of welding equipment this is no exception. The goal of automobile facilities and technicians is to restore the vehicle to its OEM condition. • The technician must be well versed in how the equipment operates, how adjustments are made and what effects those adjustments have on the weld. The technician must also clearly understand the maintenance of the equipment and the impact of poor maintenance on welds and equipment longevity. 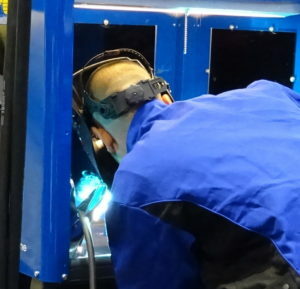 • The second and most important, aspect of the training, is weld quality confirmation. Destructive testing of weld coupons must be performed to ensure the minimum weld size is created. Physical appearance of the weld is not enough to determine the quality of the weld. Additionally, poor welds may also reduce the durability, or quality , of the repaired vehicle in time. FCA body, chassis and paint global service lead Dan Black also mentioned the idea of a test weld for squeeze-type resistance spot welding including the adhesive required in the actual vehicle joint by FCA. That’s an additional time factor a shop or insurer would have to take into consideration, particularly if it takes more than one destructive test weld to dial in equipment so the customer gets a safe and proper repair. 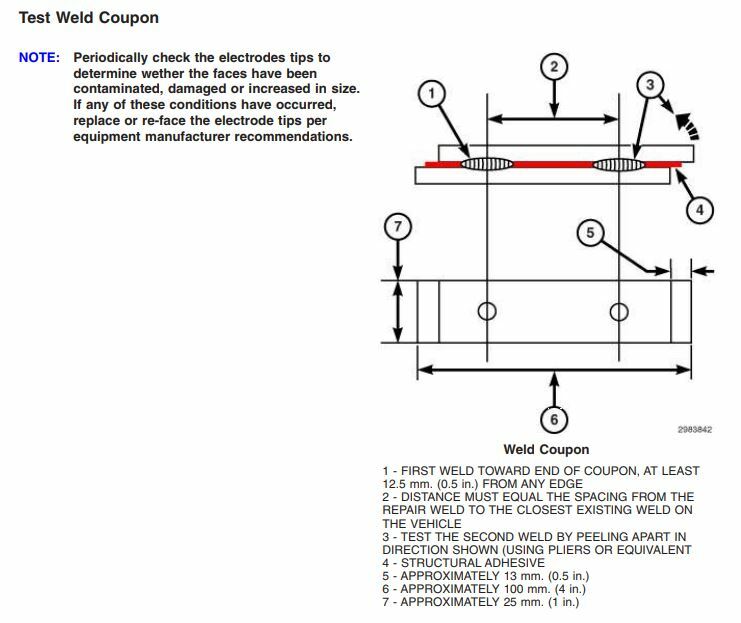 FCA has required such test welds for more than a decade at least — a 2006 Weld Bonding Guide back when the company was still DaimlerChrysler contains similar destructive testing instructions to the body repair manual for the 2017 Pacifica — including applying and adhesive for STRSW test welds. If you haven’t been doing destructive tests all that time, it’s time to get with the program. The webinar also noted that FCA bans shops from welding within 12 inches of any electrical component, which Anderson said would turn into an “antenna.” The act of welding creates an electromagnetic pulse which could be detrimental to these parts, he said. This might mean that the act of replacing a quarter panel demands a shop remove elements like a wiring harness or airbags located a foot from the weld point, he said.